The purpose of this introductory part is to present an overall view of what MCDA is today. In Section 1, I will attempt to bring answers to questions such as: what is it reasonable to expect from MCDA? 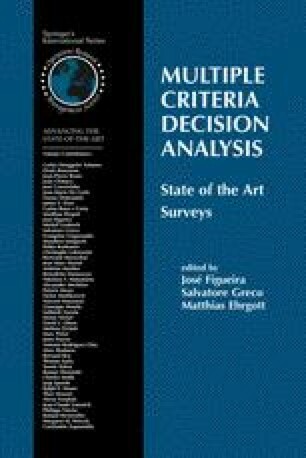 Why decision aiding is more often multicriteria than monocriterion? What are the main limitations to objectivity? Section 2 will be devoted to a presentation of the conceptual architecture that constitutes the main keys for analyzing and structuring problem situations. Decision aiding cannot and must not be envisaged jointly with a hypothesis of perfect knowledge. Different ways for apprehending the various sources of imperfect knowledge will be introduced in Section 3. A robustness analysis is necessary in most cases. The crucial question of how can we take into account all criteria comprehensively in order to compare potential actions to one another will be tackled in Section 4. In this introductory part, I will only present a general framework for positioning the main operational approaches that exist today. In Section 5, I will discuss some more philosophical aspects of MCDA. For providing some aid in a decision context, we have to choose among different paths which one seems to be the most appropriate, or how to combine some of them: the path of realism which leads to the quest for a discussion for discovering, the axiomatic path which is often associated with the quest of norms for prescribing, or the path of constructivism which goes hand in hand with the quest of working hypothesis for recommending.